Importing videos recorded on a tape to iMovie '08. 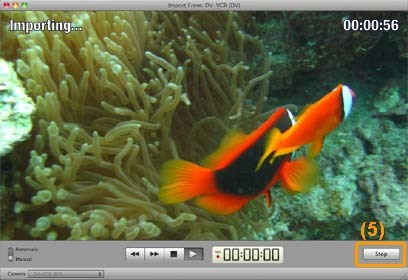 * Videos recorded in x.v.Color can be played back with non-x.v.Color-compliant devices, however, an x.v.Color-compliant device is necessary for accurate color reproduction. Insert the tape into your camcorder. Slide the POWER switch on the camcorder to the PLAY/EDIT position. Set the VCR HDV/DV and i.LINK CONV menu settings as follows. 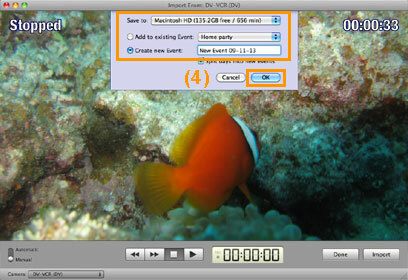 * If you use Macintosh, you cannot convert videos recorded in the HDV format to the DV format and import them. Connect the camcorder to the computer using the i.LINK cable as shown. Note: When an i.LINK cable is connected, the format of the output signal (HDV or DV) will be indicated on the LCD screen of your camcorder. A device where the images are stored is shown. Confirm that "HDV-VCR (HDV)" is selected for HDV format, and "DV-VCR (DV)" for DV format. You cannot import videos from the tape which includes both HDV format and DV format. (3) Select the location to save, input an event name in Creat new Event, and click OK.
(4) The tape will be rewound and all the videos will be imported. (5) When Camera Import Complete is displayed, click OK.
(2) Use the control buttons and rewind or fast-forward the tape to the point you want to start importing. (4) Select the location to save, input an event name in Creat new Event, and click OK.
(5) Importing starts. Click Stop when you want to finish importing. The list of the imported videos is shown. This is the end of importing. For editing, refer to Help - iMovie Help.